Experiential learning refers to hands-on experience you obtain by applying theoretical knowledge in a real-world setting. We call it learning outside the classroom! At King David, students have the opportunity to visit museums, as well as travel to Israel, Los Angeles, and Montreal to see historical sites and experience different cultures which make classroom learning come alive. The support of the Jewish Federation’s P2G (Partnership Together) program is invaluable as we strive to nurture a love for the richness of our Jewish heritage and a strong connection to Israel within all of our students. Living Jewishly within the walls of our school and out in our community reinforces the Jewish values ingrained in all our learning and actions. However, the greatest impact has been through the Grade 8 students’ personal experiences with their Israeli peers on the school trips to Israel. 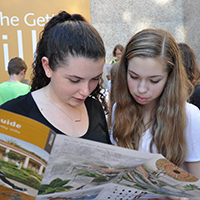 The Grade 9 trip to Los Angeles, CA, complements and deepens the knowledge acquired in the classroom. While living Jewishly within the walls of our school and out in our community reinforces the Jewish values ingrained in all our learning and actions, this trip provides students with the opportunity to explore life in a large, vibrant Jewish community. Amongst other activities, students visit the Museum of Tolerance and the Museum of the Holocaust as an extension of the Grade 9 Jewish Studies curriculum. 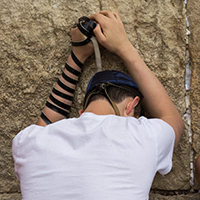 The trip also offers students the experience of a traditional Shabbat with an observant family and to immerse themselves in a community where kosher restaurants are plentiful and many families are observant. The exposure to this vibrant Jewish community in Los Angeles not only extends and reinforces the students’ classroom learning, it allows them to build connections with other Jewish communities and to gather ideas of the type of community and programming that they can build locally. King David generally kicks off the academic year with a school outdoor adventure retreat, for students and staff. The retreat has taken place at Keats Camp for the past three years, and the array of activities – archery, hiking, high and low ropes, canoeing and orienteering – provide opportunities for students to bond with their peers, students in other grades and the staff, while taking risks and building resiliency and character. 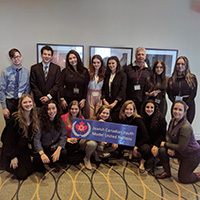 A delegation of Grade 11 and 12 students join their peers in Montreal to simulate the activities of the United Nations. The conference allows participants to learn about the countries they are assigned to represent, in addition to gaining an understanding of international relations. Our students learn to debate, negotiate, represent views they may not personally advocate, as well as to make informed decisions quickly while under pressure. 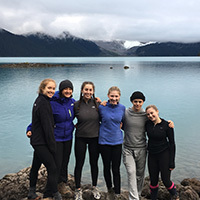 At King David we offer an Outdoor Education Experience that complements our Duke of Edinburgh Program. The Duke of Edinburgh program is a voluntary program where students engage in a variety of activities to become well-rounded individuals. The program requires students to choose a physical recreation activity, a skill to develop, engage in community service, and take part in an adventurous journey. Each year we will have Bronze (1 night) and Silver (2 night) level trips to support the students to complete their adventurous journey. 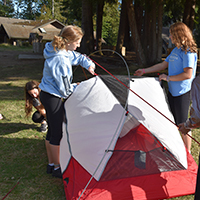 Prior to trips students will be trained in the necessary outdoor skills and planning elements. Silver level trips will also require a 1-night preliminary trip to prepare. Our Outdoor Education Experiences encourage students to explore their own resilience, cooperation and leadership skills while learning to appreciate our natural surroundings. Emphasis will be placed on safe wilderness travel and environment ethics associated with leave no trace camping. Some favourite trip sites are Cheakamus Lake, Elfin Lakes, Garibaldi Lake, and the Sechelt Inlet. Students interested in the program are encouraged to contact Mr. Dichter at gro.s1555585104hdk@r1555585104ethci1555585104dm1555585104. For more information about the Duke of Edinburgh program, please click here.